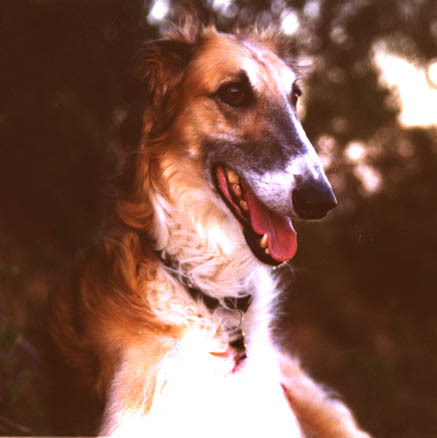 Merlin died October 2002 at the age of 12. He was always my very special loving sweet boy. He and Raven are together under the oak trees. I miss them both so very much. 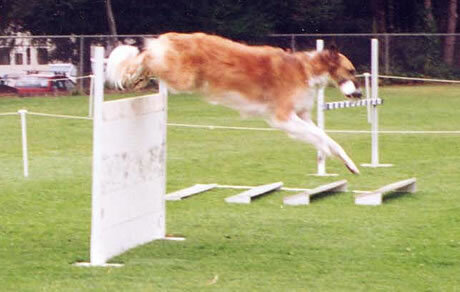 Merlin was my first borzoi and my first obedience dog. He earned his CD in 4 trials at the age of 2 with a 193.67 average. CDX average was 192.8, completed in four Trials at the age of 4. His UD average was185. He completed his UD in three consecutive trials ending with a 193 and lst place at the Kings Kennel Club in Hanford at the age of 6. Merlin was retired after completing his UD. 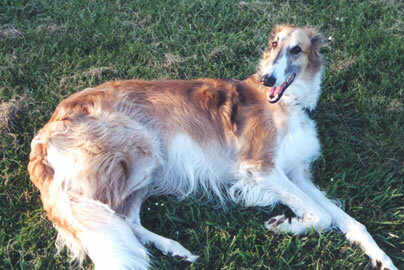 He was the subject of an article in European Borzoi in the Summer of 98. He loved to go for walks in the orchard and to ride on the front seat of the van and look out of the window. He enjoyed Obedience and after he was retired loved to play at it with me.